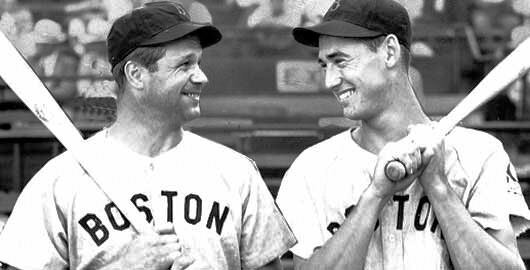 ON THIS DATE (July 3, 1940) ... On the brink of absorbing another squeamish setback from the lowly A's, those unpredictable Red Sox delivered a six run, last inning rally, and an amazing 12 to 11 walk-off victory, when Ted Williams and Capt. Jimmie Foxx, at long last reestablished their home run corporation up at Fenway Park late yesterday afternoon. With two runs already in, the Sox still trailing 11-8, one out, two teammates aboard, and 2400 faithful fans merely hoping against hope for the miracle to happen in the dying moments, Williams crashed Chubby Dean's first pitch flush up against the back wall of the A's bullpen for his 10th homer of the season to knot the count at 11-11. Two pitches later Foxx pulled his ninth round-tripper just inside the yellow left-field file post and up into the netting as 2400 onlookers when slightly mad, rushing down to rip the covers off box seats, firing hats onto the field and leaving Fenway Park in a slightly disordered state. Down 11-6, Cronin walked to open the final inning innocently enough. Then after Joe Glenn popped up to second baseman Benny McCoy. Dom DiMaggio batted for pitcher Joe Heving, popped a single into left center, which Al Simmons fumbled long enough to allow Cronin to take third. Next, Lou Finney looped a single into left, scoring Cronin. In came Dean Chubby. Doc Cramer, who had gone hitless in four previous trips, laced a single into center scoring DiMaggio and then sending Finney to third, making the score 11-8. Up came Ted Williams, and the game was tied after the first pitch. With victory now snatched soberly from his grasp, the venerable Connie Mack called on another previous Sox stopper to preserve the tie in Nelson Potter. In two pitches yesterday he became the losing pitcher. The first was a called strike to Jimmie Foxx. The second was the three-run homer to end the game and a miraculous ninth inning comeback.